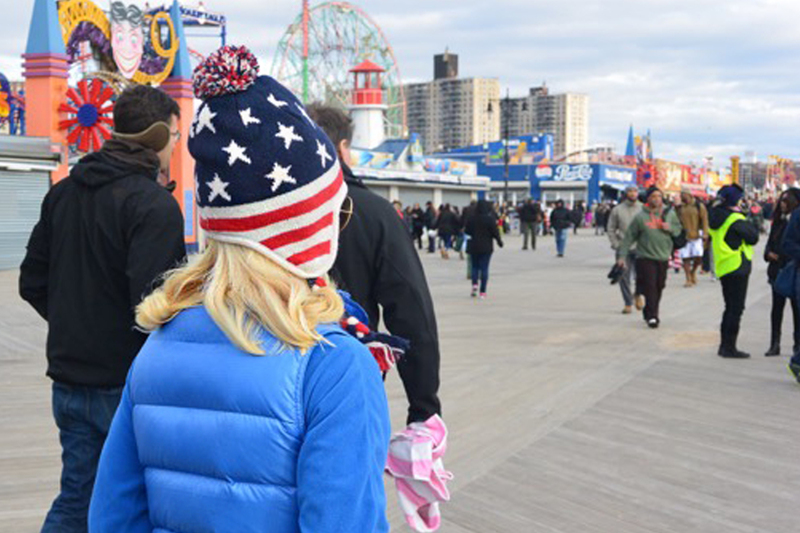 The famous Coney Island boardwalk (home of the original NATHAN’S hot dogs) was crawling with Santas, elves, mermaids, polar bears, hot dogs and very “cold” dogs. Music could be heard blasting from speakers everywhere and thousands of people were laughing, singing, dancing, and sipping from self prescribed hot toddy flasks making there way onto the cold, wet terrain – the beach. While it could have been an ordinary absurd Sunday in Brooklyn, it was indeed a well known, wacky, world wide event. January 1st is the day that separates the ‘boys from the men’ and women and children and puppies. 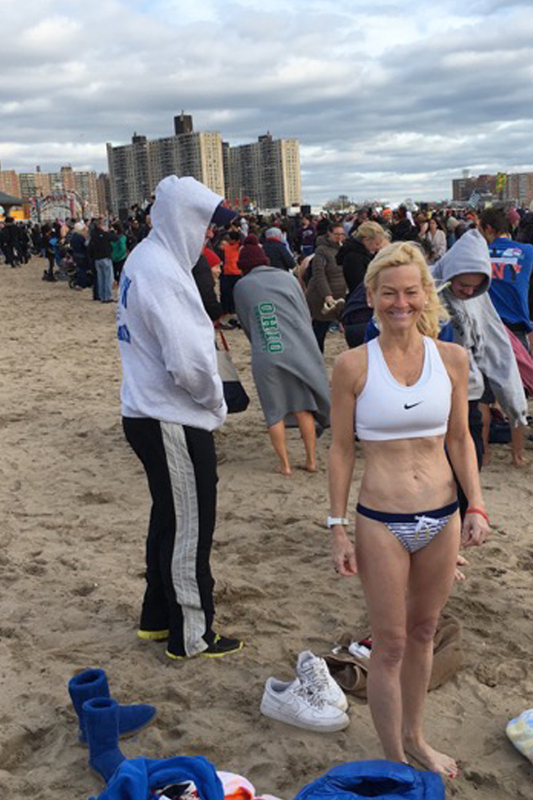 On this festive freezing morning, each year, thousands of crazies flock to Coney Island to take an ocean swim with The Polar Bear Club. This incredibly fun and frigid annual event has been happening since 1903. For more than 112 years, club members invite the world into their pool, the Atlantic Ocean, for a fun day at the beach. Clothing is optional, of course, but, naturally, bathing attire is suggested. (it’s a swim, right?) However, the clowns, that ignore the emails are what make the day so insane. People get dressed up as if going to a parade, and this year certainly did not disappoint. The costume contingent were out in full regalia, and walked proudly behind the Polar Band into the freezing Atlantic iceland The bikini bunch, my yearly suiting (and in my opinion the true meaning of the ‘bone chilling’ swim) with the winter temperatures penetrating right through to the bone, which, trust this Polar Bear – is true. 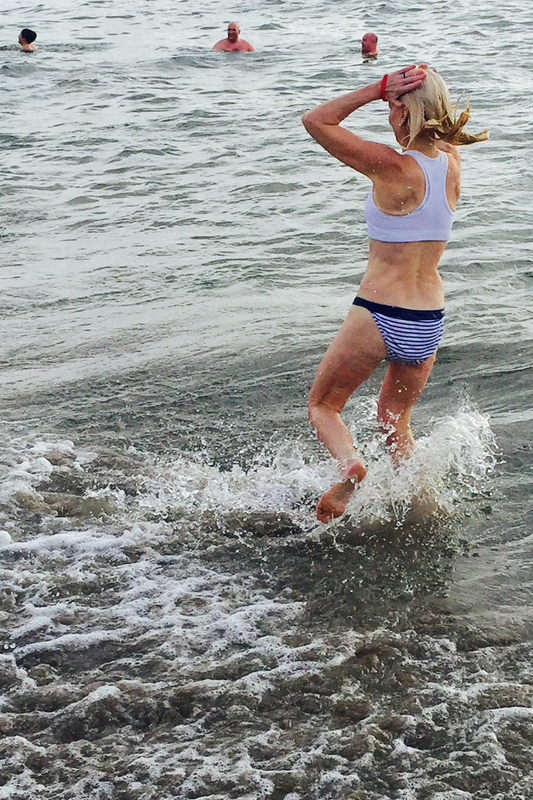 My bikini was frozen onto my body for quite a while, or perhaps, my hands were just too frost bitten to remove it. So the polar fleece, that it absolutely necessary as a post swim coverup, as is powder – crucial to quickly remove the wet sand, allowing for pink fleece slippers to slide comfortably over those blue frozen toes, which are on the feet that you can’t feel anyway. The preparation of proper, expedient post swim attire is as necessary a New Years eve tradition as the swim the following day has become, with my girl scout training finally being put to good use. This ice bath, has been a family tradition for many years, and it has taken on a life of its own – the younger set that thought it fun to go for a cold brew, are now old enough to drink cold brew. 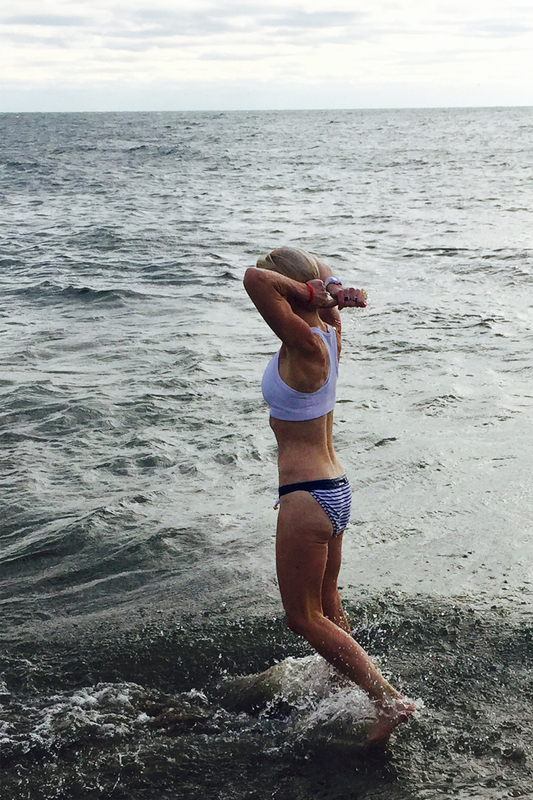 There is a sense of the unknown when the first family phone calls begin, on the day of the swim. “Are you doing Polar Bear today?” And then like a cyclone, we hurriedly meet at the Thunderbolt ride on the very same boardwalk that we walked along, many splendid childish years ago, and now again, each year as adults – with little swimmers in tow, smiling from ear to ear at the built in excitement. It is a strong family bonding session, a laughing, screaming and crying frozen tears fest for a few short hours on this first day, of, every new year. 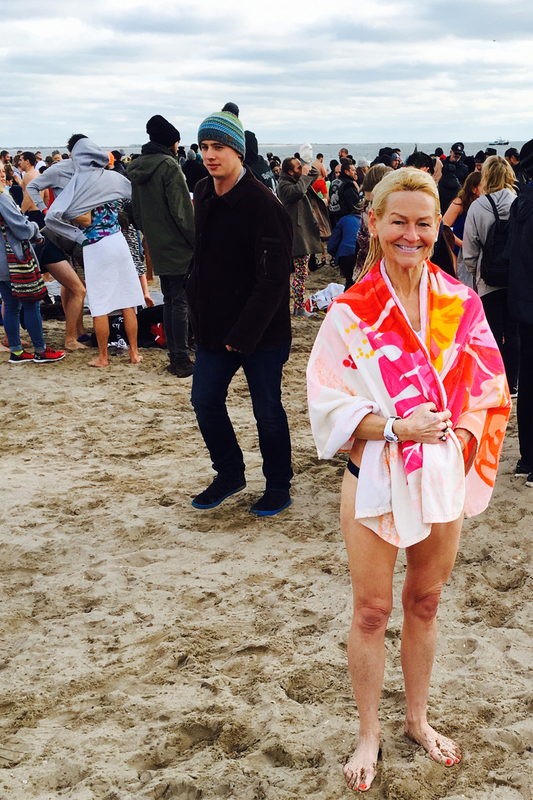 This year roughly 2700 people were current, and in frolicking in the currents at the annual Coney Island Polar Bear plunge. 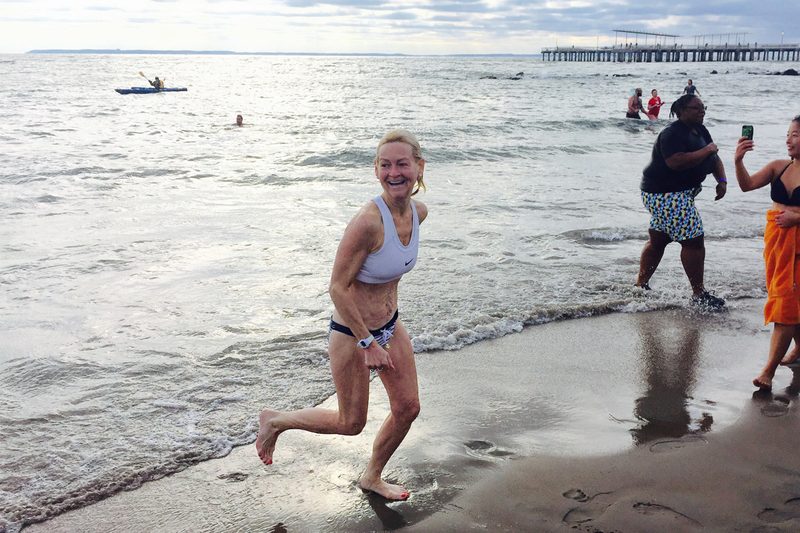 Running into the surf and then speed-racing onto the shore is an all-natural high. This festive day, a first for many on the first of a new year, is the perfect way to get pumped, to party and play, to swim and scream and shout out to a hoard of furl browed, well wishers, “HAPPY NEW YEAR” and really mean it. There are very few unhappy faces, just a bunch of shivering, heavy breathing, shaking, teeth shattering peculiar people who started off 2016 at one of the penultimate NYC events. The recollection of the water temperature on January 1, 2016 is finally fading, but the ever so faint, numbness in my toes is still a gentle reminder of what fun it is to be a part of the Polar Bears each year.